In the radiology reading room it is easy to get distracted. 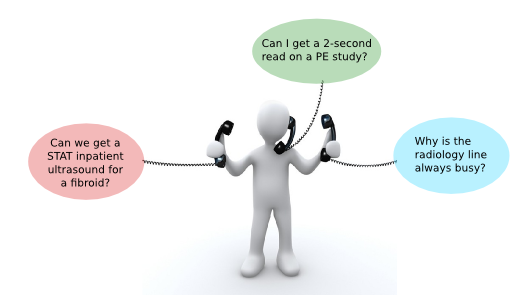 Phone calls, clinician visits, and of course, the actual study that sits on the screen. For a second year resident taking night call at Hospital of University of Pennsylvania, independent interpretation is just half of the challenge (and one I describe as The Gorilla Detection Exercise). The other half comes from managing phone calls, protocols, and physician consultations. … humans do not have Intel Inside. We suffer dramatic performance cuts because of the task-switching overhead. This is commonly referred to as multitasking, and the same term is used in this post. However, keep in mind that plenty of evidence suggests that multitasking is a misnomer: working memory can only hold one task at a time. Computers can switch their (single-core) CPUs between different tasks and do it relatively well because they have multiple levels of caches, temporary storage that hold the status of a process in case the CPU has to switch to different task. The problem is that humans do not have Intel Inside. We suffer dramatic performance cuts because of the task-switching overhead. Every time you switch tasks, your brain works a little extra to adjust. The more number of tasks and more often, the more extra effort is necessary to make these switches. The silver lining is that plenty of data show we can become better at multitasking. This happens in at least two ways. The first is practice. A Johns Hopkins otolaryngology study published in April 2015 showed that senior residents perform better than junior residents (expected), and that their performance is reduced by introduction of simultaneous tasks (also expected). The interesting finding is that the impact of distraction does not affect residents equally, and that increased seniority is correlated with improved ability to manage distraction. This data suggests that you can become resistant to distraction by acquiring experience at the primary task. We don’t always have time to wait on experience – sometimes junior physicians do need to manage multiple, equally important, tasks. Fortunately, there are ways to improve one’s ability to manage distraction without needing to rely on experience. We already know that you could create training modules for a task to improve the performance of that task. The interesting thing is that you could also create a training module for a task with the goal of improving performance on a different task by reducing the task-switching cognitive overhead. A study using laparoscopic surgery simulation show that distractions (i.e. insufflator malfunction) hurt the quality and efficiency of the main task as expected. However, the researchers took the study one step further and developed a training module to standardizes the process of managing that specific distraction. They were able to show a significant reduction in the impact of insufflator malfunction on the quality of the primary surgical task for subjects who were trained to manage it. Both practicing and training modules work because the human brain manages collections of increasingly complex information by “chunking.” For example, grouping a 10-digit phone number into three groups of 3+3+4 numbers helps memorization. It turns out that our brains may use this mechanism to train management of multiple tasks as well. A new October, 2015 study from shows that multitasking training helps because it trains the body to “chunk” components of each task into a single unit and store them in the frontoparietal subcortical white matter. In other words, if we can mentally reduce a complex task into a set of specific steps, then switching is much easier. It is not always possible to eliminate distractions. In the reading room, competing interests among reporting productivity, clinician consultation and technologist guidance constantly vie for a radiologist’s attention. All hope is not lost. We can get better at these tasks, and other specialties are already ahead of radiology. It’s time we apply our rigor of evidence-based medicine not only to what we practice but also how we do it. This entry was posted in Residency Productivity 'Hacks'. Bookmark the permalink. Keep up the good work – a feedback more valuable than it seems.